Our firm has gained continuous appreciation as the prime organization offering of Fiber Laser Marking Machine. 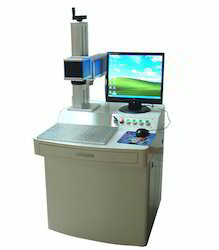 This machine is used for marking auto components, astronautic apparatus, chips of electronic IC, packages of food, drink and , mobile phone, batteries, computer peripherals, tools, and cables. In addition, this machine is built and developed adhering to industry norms. Furthermore, our professionals opt for strict quality inspection made on the machine to ensure high performance. 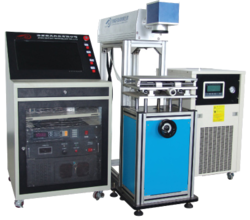 This machine can be used for marking auto Components, Astranautic Apparatus, chips of Electronic IC, packages of Food , Drink & Cigrattes, Mobile Phone, Batteries, Computer Peripherals, Tools , S.S Utensils, Watches, Jewellery, Bearings, Wire and Cables. +1,00,000 Hr. of expected laser life. Compact design for ease of integration. 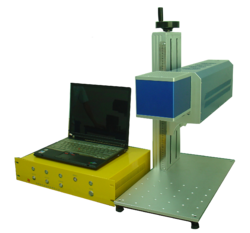 Relying on excellent laser beam technology with supported modern machineries; this Co2Laser Marker Machine is used in many industries for its active use. Offering the wide industrial solutions, this machine is known for marking various bar codes, data matrix or graphics on various objects for their easy traceability and identification. Our technological adeptness has made us the pioneers of developing leading quality Engraving Laser Machine. 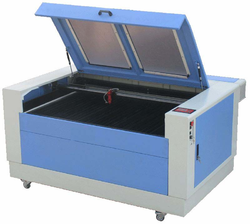 This machine offers superior performance in engraving and cutting on acrylic, wood, variety of plastic materials. Its highly advanced USB support eliminates the need of computer. Equipped with highly efficient laser tube, the offered machine is tested for its reliability and durability. Bestowed with an ingenious team of designers and advanced production unit, we have been able to introduce an exclusive range of Diode Laser Marking Machine. This laser marker is used for marking on electrical equipment, plastic key, rubber, cell phone, jeweler (hallmarking) and in communication instruments. In the offered machine, all the components and material used have been approved and certified by agencies. In addition, this machine is built and developed adhering to industry norms. Furthermore, our professionals opt for strict quality inspection made on the machine to ensure high performance. This laser marker can be used for marking on electrical equipment, Plastic key, rubber, cell phone, jewellery (Hallmarking) and in communication instruments.